You’re in a mall when suddenly your smartphone beeps. It’s an offer for 20% off a pair of shoes you’ve been looking at online — from the store you just walked past! As business people, we know it’s not magic, but rather analytics powering these outstanding customer experiences. 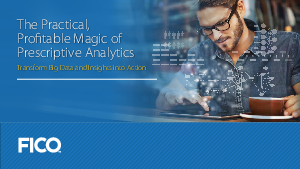 Analytics have evolved to the point where they answer an expanding range of useful questions. But understanding the different types of analytics – descriptive, diagnostic, predictive and prescriptive - and how to use them in your business can be challenging. Download the eBook to learn about the least understood – yet most powerful – tool in the analytic arsenal. Prescriptive analytics enable you to estimate and compare the likely outcomes of any number of actions, and choose the very best action to advance business objectives. Getting there isn’t as difficult as you think. Start your journey. Download the eBook today.